I assemble my scented waters in these jars for easy microwaving and storing in the fridge & freezer. This is designed to warm candle wax, but it also can be used to warm scented waters in a small area like a bathroom. Comes in 4 colors. 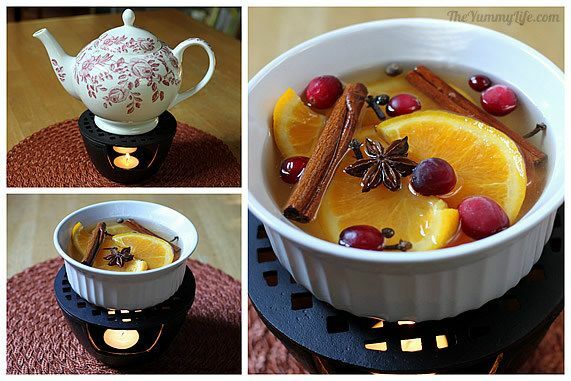 This uses the heat from tea lights to keep a pot of tea or these fragrant waters warm. A tea light beneath this pot keeps fondue or scented waters warm. I use this to shave and grate whole nutmeg. I also use it for zesting citrus and grating Parmesan cheese & garlic. This fragrant licorice spice looks pretty in the fragrant waters. My favorite spice for scented waters. These have the most staying power and can be reused several times. These are pricier than vanilla extract, but they're very fragrant. This keeps my mug of coffee warm, and doubles as a warmer for fragrant waters in a small area like a bathroom. 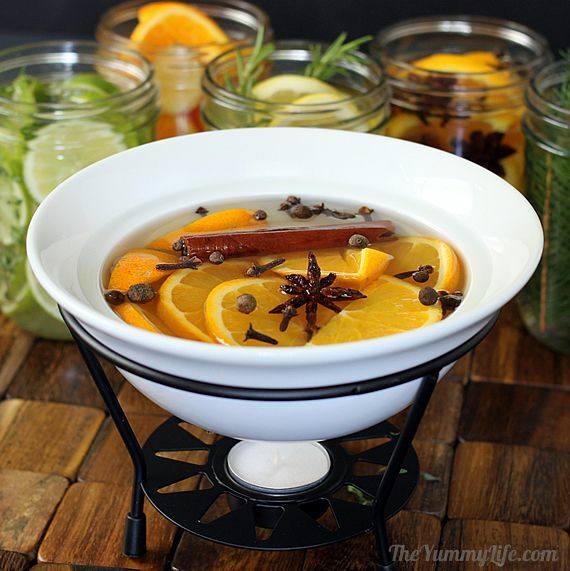 Add fragrance to your home using simmering waters infused with spices, herbs, & fruit. --add heated mixture to a slow cooker, fondue pot, or something similar that will keep mixture heated. Preheat waters to a boil (in microwave or on stove top). As water evaporates, always top it off with HOT water to keep the temperature as high as possible. Higher heat = more fragrance. 2. Lemon, Rosemary & Vanilla. 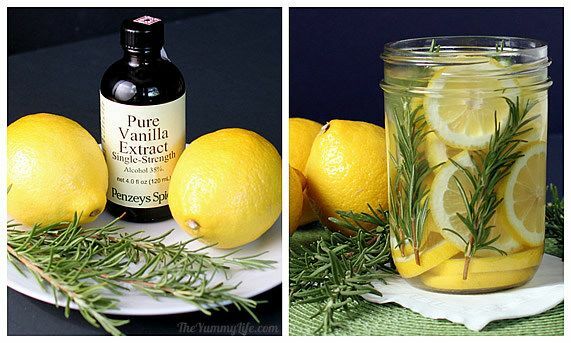 3 sprigs of fresh rosemary, 2 lemons, 1 teaspoon vanilla extract. 3. Lime, Thyme, Mint & Vanilla. 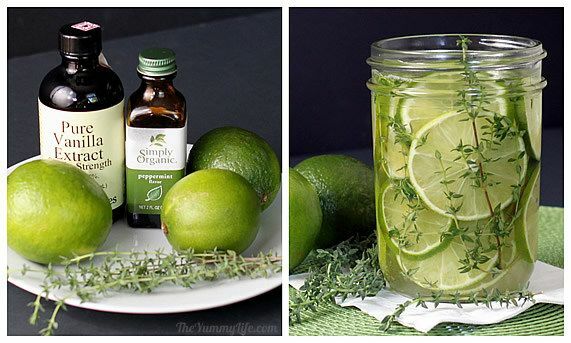 3 limes, 3-4 sprigs fresh thyme, 1/2 teaspoon mint extract, 1 teaspoon vanilla. 4. 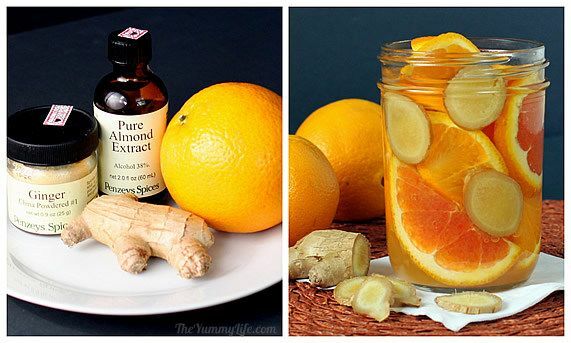 Orange, Ginger, & Almond. 1 orange (or peel from 2 oranges), one 4" finger of ginger, sliced (or 1 tsp ground ginger), 1/2 teaspoon almond extract. 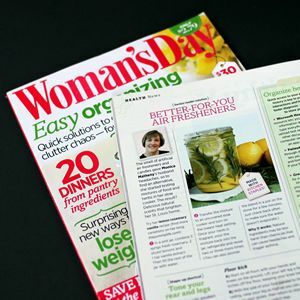 This post was featured in the April 2013 issue of Woman's Day magazine. Here's the thing. I'm married to a man who hates artificial scents of any kind. That goes for air fresheners, candles, perfume, soaps and anything else that is scented. We buy unscented everything. I could probably buy a car with the money I've saved on perfume throughout the years of our marriage. Turns out that King-Man may just be ahead of his time. I've recently been reading about air fresheners and their harmful ingredients. Many of them are especially hard on people with allergies and asthma. One more thing to stay away from. But, the air in my house gets stale sometimes. Or, the day after I've cooked with garlic, that aroma that was so appealing when I was cooking becomes very unpleasant. I want to walk into my house and have it smell pleasant. Nothing overpowering or even that noticeable. Just pleasant. There is a simple, all natural, truly lovely solution. 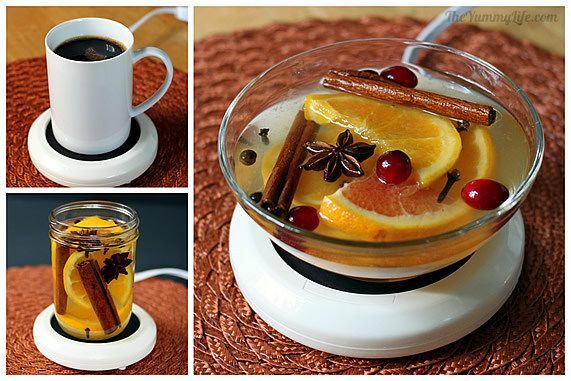 That is to fill the air in my home with subtle scents of spices, herbs, and fruit. All I have to do is simmer some sweet smelling ingredients in water. The steam fills the air with a pleasant scent. Truth is, I did this many years ago on the advice of our realtor when we were selling our house. Realtors often advise sellers to bake cookies or boil cinnamon water right before a potential buyer drops by. That inviting aroma goes a long way to leave a good first impression. Why I didn't continue scenting the air in a similar way for our own enjoyment, I don't know. 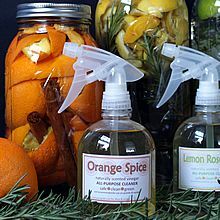 I've now got a simple routine going that keeps our house smelling pleasant without staleness or day-after garlic odor. Keeping the supply list simple. 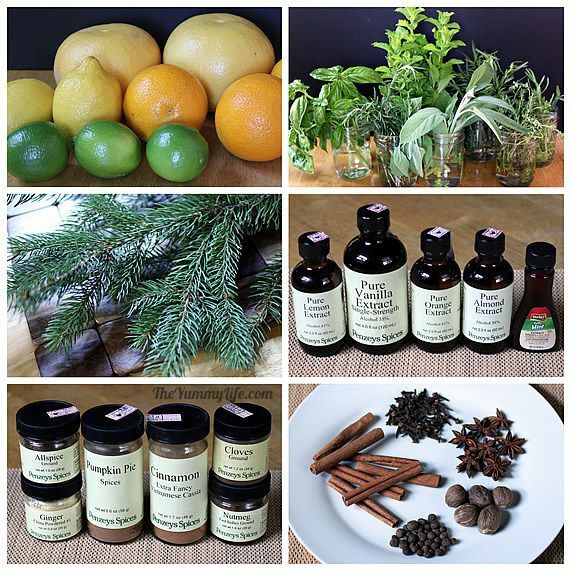 I only used items available at the grocery store or in my yard for these scent recipes. I want this to be easy and inexpensive so that I can set up a sustainable routine of pleasantly scenting our home. These recipes are simply guidelines and don't have to be followed exactly. In fact, I change them up all the time based on what I have on hand in my kitchen or yard. citrus -- I've tried other fruits. Some of them smell good initially, but they don't hold up for more than one use. 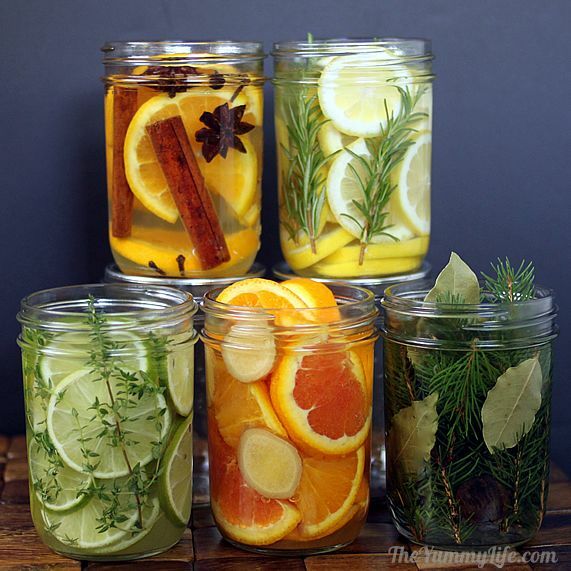 Citrus is sturdier, longer-lasting, and gives these scent recipes freshness. Lemons and oranges are particularly fragrant and have the best staying power in these scented waters. 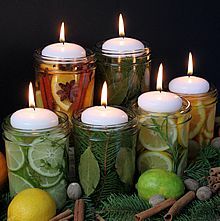 herbs -- Any herb can be used for making a room scent, but the ones that are sturdier and on woody twigs hold up the best. My favorites for room scents are rosemary and thyme. pine or cedar twigs/needles -- There may be other fragrant trees that will work, too; pine and cedar are the two I've tried for their appealing, fresh fragrance. extracts -- A touch of vanilla or almond extract improves most room fragrance mixtures. Mint extract has a nice fresh scent. You can also use whole vanilla beans instead of vanilla extract; pricey but amazingly fragrant. spices -- You can use ground or whole sweet spices. 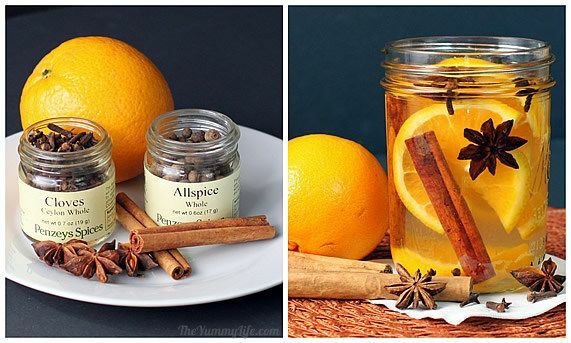 The whole spices look prettier, if your scented water will be in a location where it will be seen. I have found that cinnamon sticks and whole cloves have the most scent staying power. Cinnamon sticks can be rinsed off and reused several times. They keep on giving. These are all scents that my nose likes. But, scents that are pleasing to one person may not be to someone else. Consider how many different scents of perfumes, soap, and candles there are in stores in an effort to appeal to the masses. So, use my recipe combos as guidelines that you can tweak and customize to suit what your nose likes. General procedure: Combine the ingredients in a 2 cup (pint) jar or container, or in a pan on the stove top. Cover them with water and heat. I'll explain different heating options further down. Keep reading. Scent #1: Oranges, cinnamon & cloves (allspice and anise are optional). This is my favorite, both for it's wonderful aroma and for it's staying power. This scent carries into multiple rooms better, and it can be reheated to scent your rooms for several days. Scent #2: Lemon, rosemary, & vanilla. A similar scented water is often simmering in Williams-Sonoma stores. It has a lovely freshness to it. Scent #3: Lime, thyme, mint & vanilla extract. This combination has such a fresh, pleasant scent. I initially made it without the mint extract, but have found that it really kicks up the aroma. Scent #4: Orange, ginger (fresh or powdered), and almond extract. This is a sweet, delicious scent. 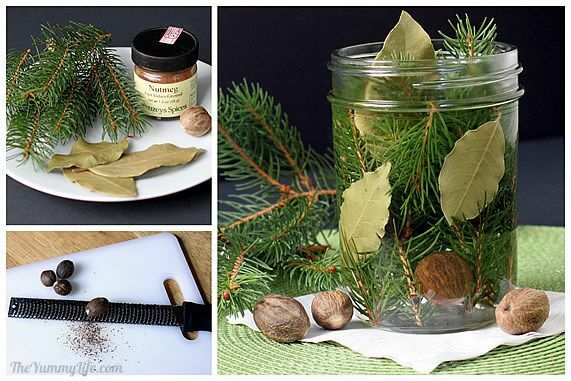 Scent # 5: Pine or cedar twigs (or other fragrant twigs), bay leaves, and nutmeg. These scents combine for a complex aroma. If you have whole nutmeg, use a microplane to grate off the outer surface--this will release the scent. Add the whole nutmeg piece along with the gratings. Here's the gang of five. Aren't they beautiful? 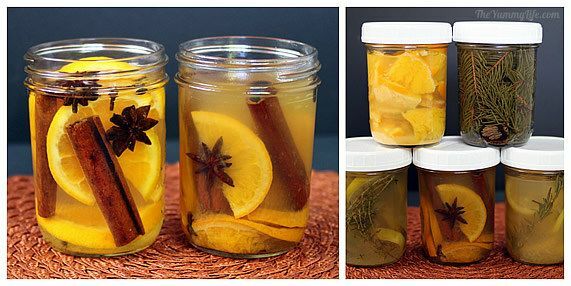 I like to make these up in pint jars and keep them on hand in the fridge so I'm ready to start a pot of simmering scents as needed. ...store in the fridge. 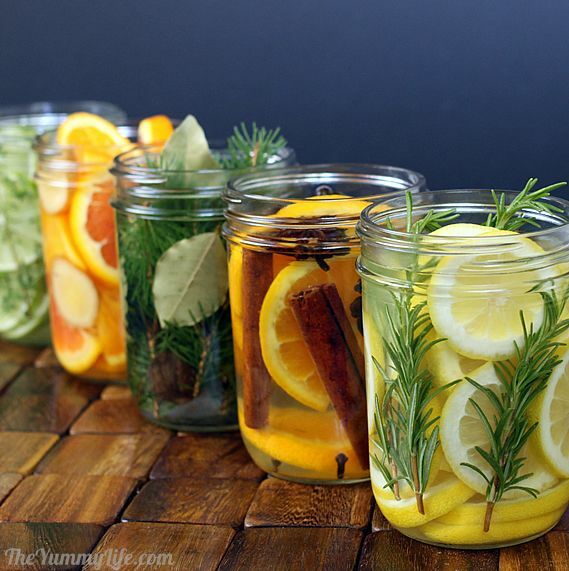 Uncooked jars of scented waters will keep in the fridge for 1 to 2 weeks, so you can make these ahead to have on hand. 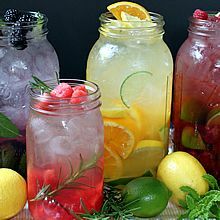 I recommend adding all of the ingredients, including the water, to the jars before refrigerating them. I've tried refrigerating the fruit/spice/herb combos in jars without the water, but they don't last as long that way. I've tried a variety of methods, and all of these work to varying degrees. Some of them provide a more powerful scent than others. Just like the air fresheners you buy, none of these will scent a whole house; but I'll show you some ways to set up individual scent sources in multiple rooms. Hopefully you already have what you need to try out one or more of these options. Stove top method. This is by far the best way I've found to get the most powerful scent that will spread to more rooms the fastest. It's easy as can be. Simply combine the ingredients in a pot on the stove, bring them to a boil, and then lower the heat to a simmer. They will immediately begin to scent your kitchen and spread to other rooms. How far the scent spreads depends on the size and layout of your house. A simmering pot like this makes all four rooms on our first floor smell good. The only drawback of this method is that you have to keep a close eye on the water level. If the pan dries out, you'll be smelling burned citrus instead of sweet, fragrant citrus. 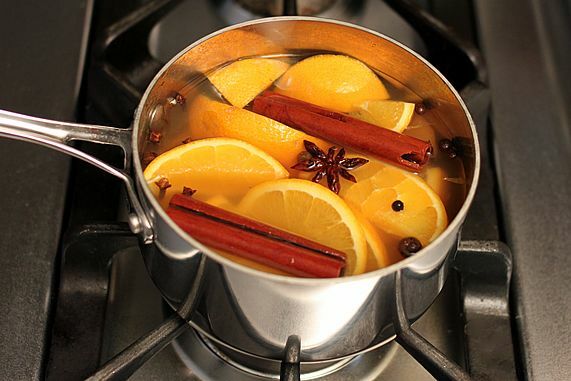 NOTE: For a stronger scent, simply double or triple the recipe in a larger pot on the stove. Uncovered Slow Cooker Method. This is my personal favorite. I use a mini slow cooker--the kind made for keeping dips and sauces warm. Mine only has one low heat setting. The mixture never actually bubbles and visibly steams. I leave it uncovered on my kitchen counter to slowly release scent throughout the day. It's subtle, but creates a pleasant smell in my kitchen and a hint of scent in surrounding rooms. When I'm home, I keep my mini slow cooker going. It's easy and uses very little electricity. When I fill mine in the morning, it won't dry out for an entire day. If you're concerned about accidentally letting it run dry, you can put a lamp timer on it so that it automatically shuts off at the desired time. I put a scented jar mixture in the microwave for 2 minutes to get it really hot before I add it to the slow cooker. That gives it a jump start on releasing the scent. 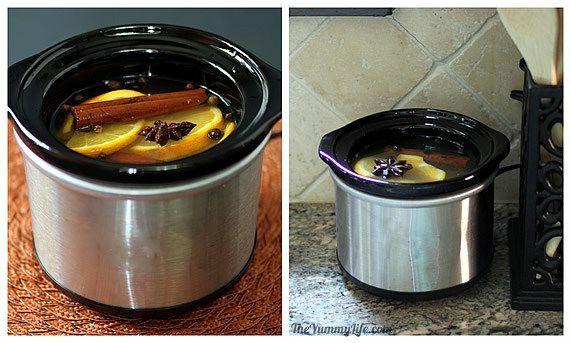 NOTE: For a stronger scent, simply double or triple the recipe in a larger, full-size slow cooker and set it on high. ♦16 oz. mini slow cooker --holds a single batch--compact & economical--removable insert for easy cleaning; this is the size I use for regularly simmering scented water in my kitchen and is a great size for gift giving, too. ♦1-1/2 qt. small slow cooker --holds double or triple batch--removable insert for easy cleaning; the larger size doesn't have to be refilled as often. Fondue Pot Method. If you have a fondue pot, then you have a portable scent station. Set it up in any room you'd like to scent. Below is a small ceramic fondue pot I have that uses a tea light for heat. So, this will only remain warm as long as the candle lasts--3-1/2 to 4 hours. Like the slow cooker, this is a low level of heat and releases a very subtle scent--enough for a small room. Get the scent mixture boiling hot before adding it to the fondue pot. I like to set this up in our entry way when we have guests. It makes it smell wonderful when you walk through our front door. And, it looks pretty. Mug Warmer Method. I normally keep this little mug warmer next to my computer to keep my coffee and tea warm. I've discovered it also can be used to keep a jar or small bowl of scent mixture warm. It only keeps it warm, it doesn't actually heat it up. So again, be sure to heat the mixture before adding it the bowl. Or microwave a jar and set it right on top of the mug warmer. This low heat puts off a soft, subtle scent that is suitable for a small area like a bathroom. Here's a hint to keep it pretty. As the mixtures cook and lose their color, they're not as attractive. You can spruce it up by floating a fresh slice of citrus on top. Or add a few cranberries (I keep a bag of them in my freezer); they float and add a touch of color. Candle Warmer Method. These work just like the mug warmers. 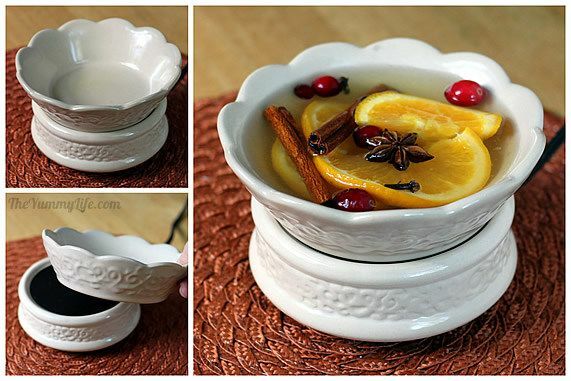 Candle warmers come with a little bowl on top for melting scented candle pellets. Instead, you can add some heated scented water. Or, remove the bowl and set a jar or other bowl on top. Note: I tested the temperatures of these with a thermometer. The mug warmer and candle warmer both kept the mixture at about 120°F. That's enough to let off a very subtle scent in a small area or room, but don't expect these to strongly scent a big room. You need more heat and steam for a stronger scent. Tea Pot Warmer Method. My tea pot warmer also uses tea lights. I can put two or three tea lights in mine to achieve the temperature I want. These only last as long as the tea lights burn, but they can get hotter than the mug and candle warmers, thus releasing more scent. I can put a bowl or jar on top of my tea pot warmer, as long as I put it somewhere that I can keep an eye on it. I don't like to leave candles unattended. Add more hot water as needed. As the water evaporates from any of these warming bowls or jars, top it off with additional HOT water. It needs to be hot when it's added so that it doesn't cool down the temperature of the scented water. Higher heat = more fragrance. Gift them! These make a fun, unique hostess gift. Take one along to a party as a gift for your host that can be simmered and enjoyed the next day. Reuse each mixture 2-3 times. After these have been heated and simmered for awhile, the water becomes cloudy (as you can see in the jars below), and some of the ingredients lose their vibrant color. Although they don't look as pretty, they still smell good. Usually, you can reheat and simmer these again 2-3 times. Jar them up and refrigerate them between uses. Open the jar and give it the sniff test--if it still smells good, reheat and reuse it. Add more water as needed. You can save, use and reuse a number of fragrant ingredients. These scents don't need to be expensive. Leftover ginger -- If you ever cook with fresh ginger and end up with leftover pieces , this is a way to use them up before they spoil. Slice the leftover ginger and freeze it in a bag or container to have on hand for whipping up a quick batch of scented water. Save your orange peels -- When you eat an orange, save the peel for use in scented waters. Store them in the refrigerator or freezer until you need them. Save your juiced lemons and limes -- After you've juiced these for use in a recipe, refrigerate or freeze the leftover pieces. 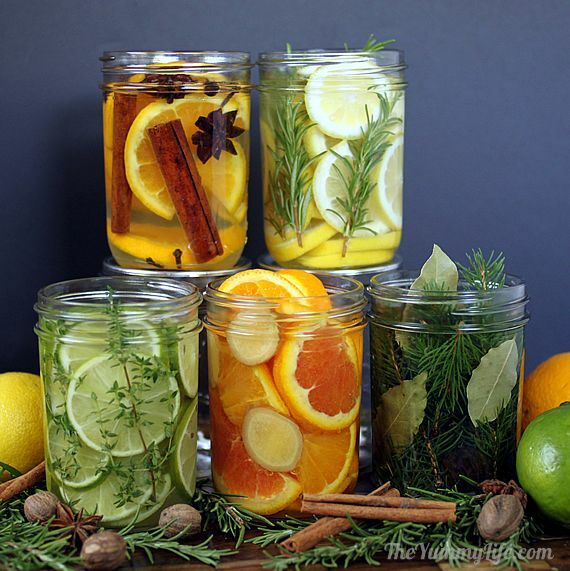 Save your leftover herbs -- If you have herbs in a garden or have leftover herbs that you've purchased for cooking, they can be frozen and saved for use in these scented waters. Use expired juices. If you have fruit juices that are past their prime, use them as a base in place of the water in these mixtures. They're both fragrant and colorful. Use expired spices. Spices are supposed to be replaced after a year, because they lose much of their flavor. But, they still smell good! 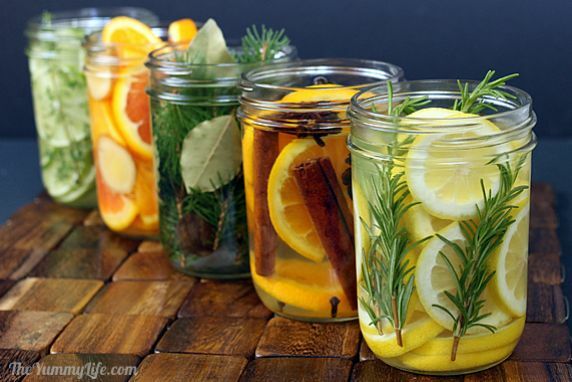 Instead of throwing out old spices, use them for scenting water. There are endless combinations for these scented waters. If you have some additional ideas, please share. I'm always looking for a new, pleasant scent for my home. Oh, and good news . . . King-Man likes these natural scents. Happy husband, happy home.